Finding a balance between maximizing the biosecurity benefit and the ease of use for vignerons will play a key role in determining the future of software to help keep pests and diseases out of vineyards. 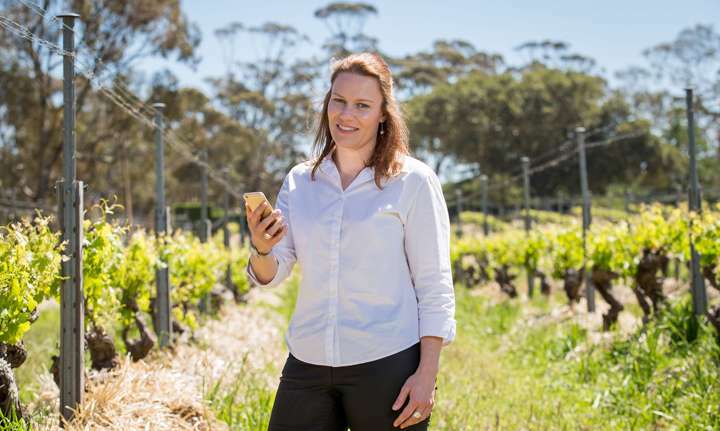 A six-month trial of a vineyard visitor management app in South Australia has ended with relevant agencies expected to soon make a decision on its future. 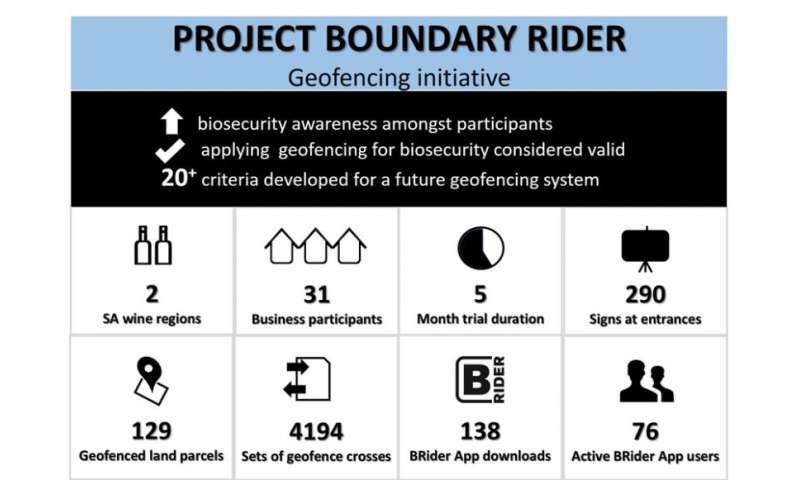 The Vinehealth Australia pilot project, known as Project Boundary Rider, involved virtual fences about 130 separate land parcels managed by 31 viticulture businesses in Barossa Valley and McLaren Vale from December to June. GPS technology was used to detect the movement of each person carrying a smartphone with location services enabled. A purpose-built app called BRider then logged movement of the individual in or out of each geofence. The visitor movements were collated into an electronic visitor book for each geofence, providing the visitor name, date of visit, timestamp and visit duration. The total number of boundary crosses for the pilot was 8,388. There were no significant biosecurity threats reported during the trial, which included the busy vintage period from February to April. The trial was attracted inquiries from as far afield as the United States and Spain. Canadian technology company Be Seen Be Safe provided the geofencing software for the trial, which was adapted from the poultry industry in Ontario. Participating growers included Chapel Hill Winery, Charles Melton Wines, D'Arenberg, Dorrien Winemaking, Gemtree Wines, Henschke Cellars, Noon Winery, Scholz Estate, St Hallett Wines, Torbreck Vintners, Wirra Vineyards and Wright Vineyard Trust. Vinehealth Australia Technical Manager Suzanne McLoughlin, who managed the pilot project, said teething problems included significant battery draw on mobile devices and inaccurate fence mapping. She said finding a balance between a user-friendly system while still providing enough detail to be a valuable biosecurity tool was crucial. "If you are going to use it for biosecurity you really want as many people involved as possible," McLoughlin said. "We really need to decide now with industry what the best way to go is … we're at the point of deciding what the value proposition should be and how do we make it simple." Vinehealth Australia is preparing a report on the trial for participants, Be Seen Be Safe and Primary Industries and Regions South Australia (PIRSA), which funded the trial. PIRSA will then decide whether further funding for the project is warranted. However, it is likely that additional industry or government organisations would need to invest in the project if it was to be rolled out more broadly. South Australia produced 51 per cent of the Australia's crush in 2016 and about 75 per cent of Australia's premium wine from some of the oldest vines in the world. Biosecurity is of particular importance to the South Australian wine industry because it is phylloxera free. The movement of people and vehicles is a key biosecurity risk for vines, as pests and diseases such as phylloxera can be spread on footwear and tyres. McLoughlin said the greater the take up of the app by vignerons if and when it was rolled out again, the greater the benefit. "If you are going to look at it from a holistic biosecurity perspective then you really want it to be all in for it to be as effective as possible," she said. "We definitely see the value in it we just need to consider the whole package now and work out what would be the best system to go with if we were to launch it going forward. "Realistically it could be used anywhere, even in states where they do have phylloxera they could potentially quarantine around infected zones and risk zones for example and communicate messages to people who are crossing those boundaries." Vinehealth Australia CEO Inca Pearce said geofencing was a powerfulk tool to help growers and the broader industry respond to pest and disease incidents and prevent further spread. "Phylloxera doesn't respect vineyard boundaries or state borders. We must ensure our biosecurity is rigorous and we must be looking at new technology to support vineyard owners in their efforts," she said. "The biosecurity landscape is constantly evolving, with trends in trade, tourism, climate change and business ownership increasing the extent and nature of biosecurity risks." How accurately can farmers identify invasive pests?